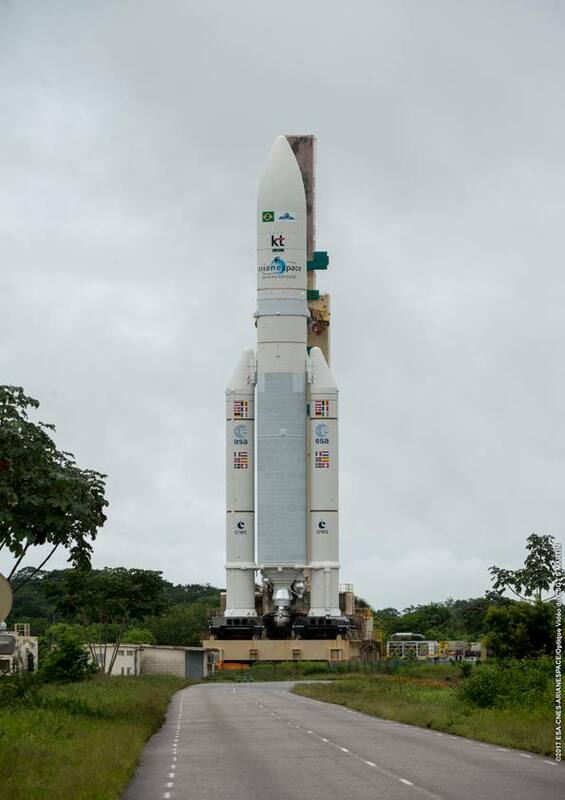 A month-and-a-half after a general strike in French Guiana halted launch preparations, an Ariane 5 rocket arrived at its launch pad Wednesday on the northeastern coast of South America, a day before hauling two communications satellites into orbit for the Brazilian government and a South Korean company. 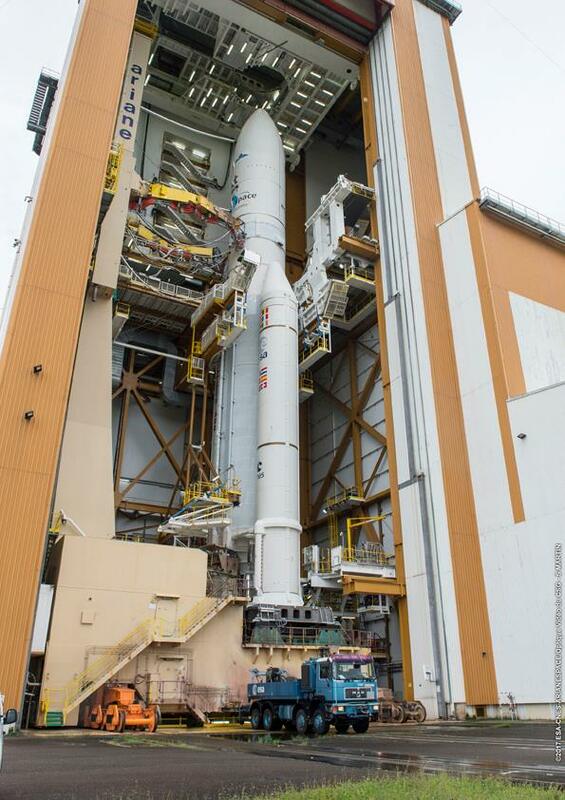 The two French-built satellites are mounted one on top of the other inside the Ariane 5’s nose fairing, ready for liftoff at 2031 GMT (4:31 p.m. EDT; 5:31 p.m. French Guiana time) Thursday. The launch window extends for 168 minutes. 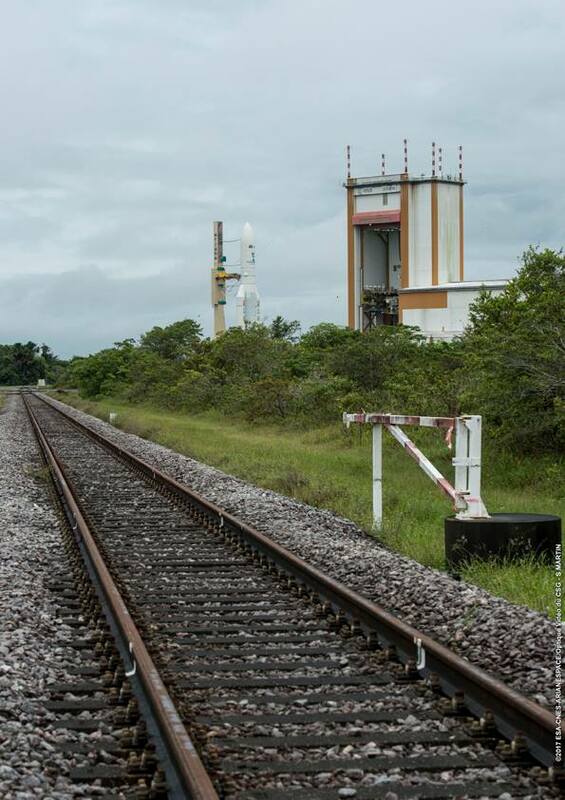 The Ariane 5 rocket and its mobile launch platform emerged from the final assembly building at the Guiana Space Center on Wednesday morning, pulled by a diesel truck along dual rail tracks for the 1.7-mile (2.7-kilometer) trip to the spaceport’s ELA-3 launch zone. Standing 180 feet (55 meters) tall, the Ariane 5 will launch for the second time this year Thursday, and make its 92nd flight overall since debuting in 1996. Thursday’s mission will be Arianespace’s fourth launch of 2017, a tally that includes missions with Soyuz and Vega launchers. 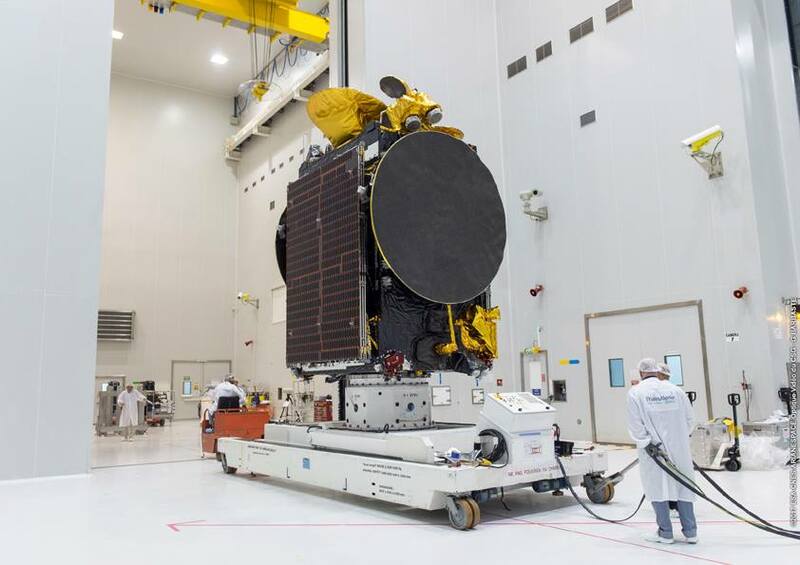 The launch of the SGDC and Koreasat 7 satellites was scheduled for March 21, when a strike by technicians responsible for transferring the Ariane 5 rocket to the launch pad prevented rollout on the eve of liftoff. 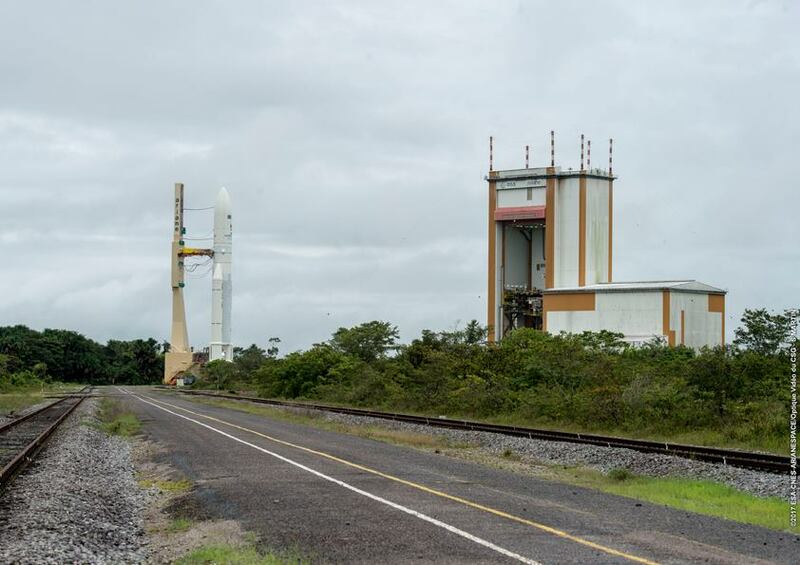 Although the labor issues at the Guiana Space Center were resolved within a few days, a wider net of social unrest and a general strike took hold across French Guiana. Protesters spoke out against high crime rates and voiced their concerns about health care and education across the region, which is considered an overseas department of France with the same political rights as citizens in Europe. Some targeted the space center and set up barricades on roads leading to the spaceport, hoping the disruption would gain attention from European politicians. Representatives of the French government and local activists signed an agreement April 21 to end the general strike. The French government plans a multibillion-euro aid package for French Guiana to fight crime, repair and upgrade infrastructure and expand schools in the region. 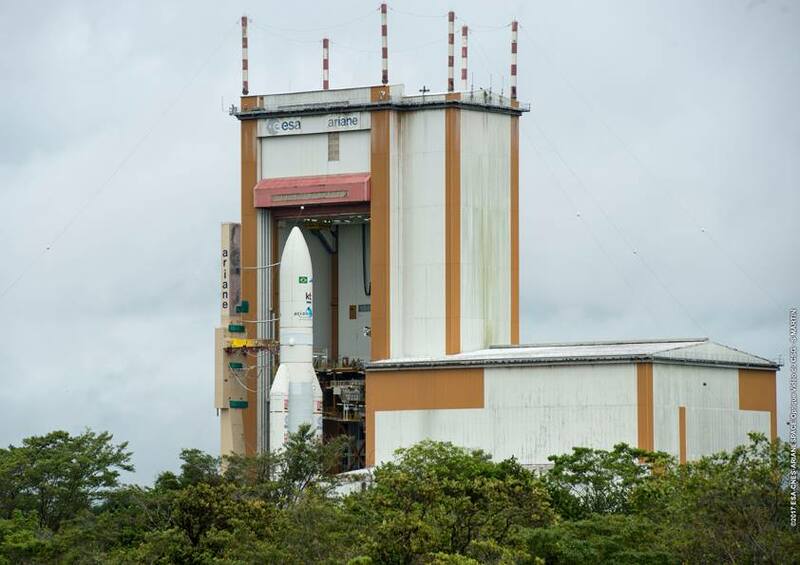 The accord cleared the way for launch operations to resume at the Guiana Space Center, and Arianespace rescheduled the Ariane 5’s launch of the Brazilian and South Korean satellites for this week. 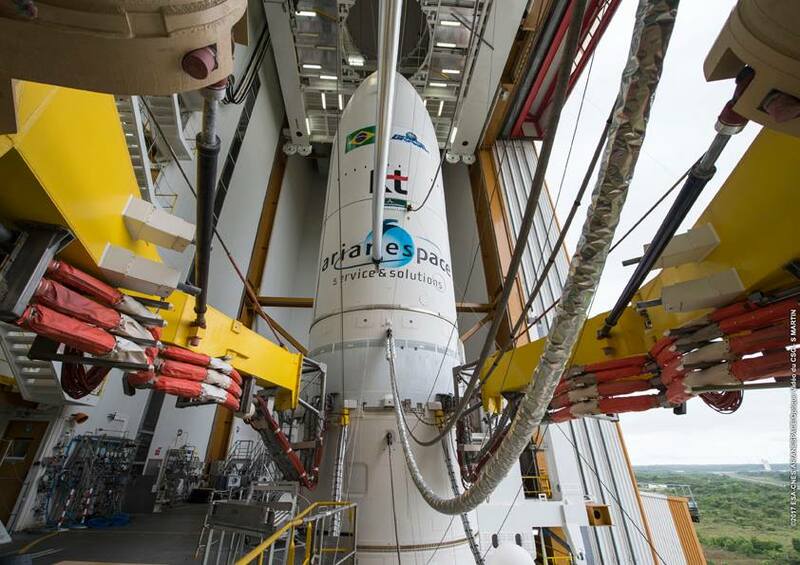 Brazil’s SGDC spacecraft will ride in the upper position of the Ariane 5’s dual-payload Sylda structure. 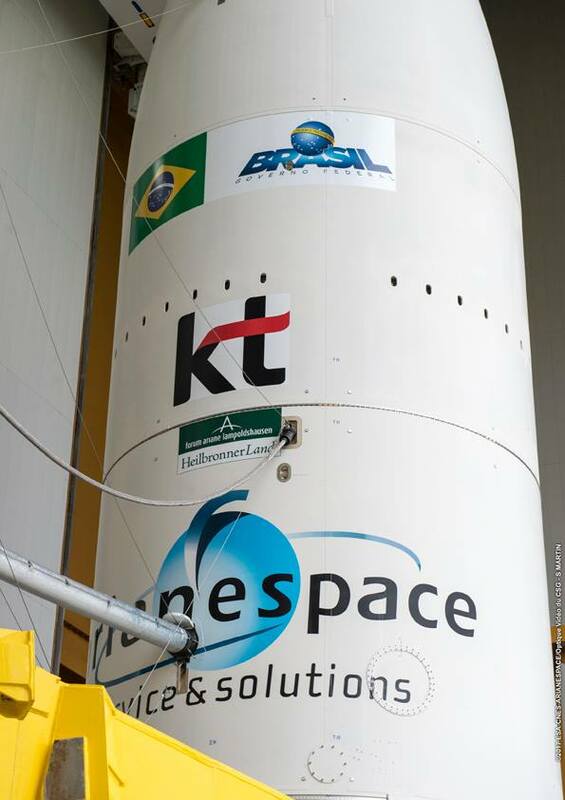 The 12,643-pound (5,735-kilogram) satellite is launching on a dual-use mission for the Brazilian military and to help bridge the digital divide for far-flung Brazilian citizens. During its 18-year mission, SGDC’s 57 Ka-band and X-band transponders will be capable of delivering more than 57 gigabits per second of throughput across Brazilian territory from a perch in geostationary orbit along the equator at 75 degrees west longitude. SGDC stands for Geostationary Satellite for Communications and Defense in Portuguese. The Koreasat 7 payload, mounted in the lower position inside the Ariane 5 fairing, is on the way to an operating post in geostationary orbit 116 degrees east longitude. Owned by KTsat, based in Seoul, Koreasat 7 weighs 8,113 pounds (3,680 kilograms) fully fueled, carrying enough propellant for 21 years of service life, according to Hun Chul Lee, the satellite mission director. 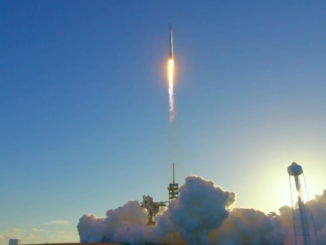 “Koreasat 7 will provide a full range of video and data applications, such as direct-to-home broadcasting, Internet access and VSAT (very small aperture terminal) services with mainly Ku-band transponders and an added Ka-band steerable beam,” he said. The new spacecraft will extend KTsat’s reach into new markets, such as Indonesia, the Philippines, Indochina and India. 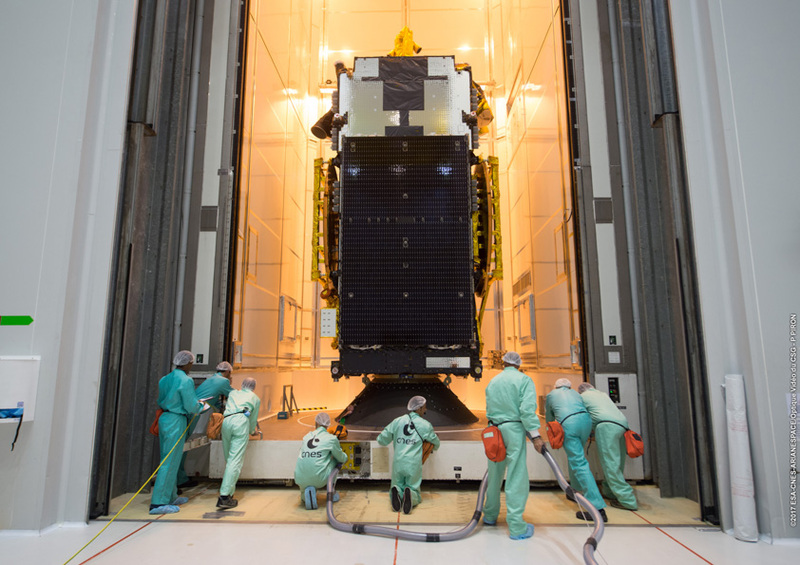 Both satellites on Thursday’s flight were manufactured by Thales Alenia Space, which assembles spacecraft at a plant in Cannes, France. Since the space center reopened, the launch team conducted a second rehearsal to practice countdown procedures and re-inspected the Ariane 5 prior to rollout. Final arming of the launcher was completed Saturday. 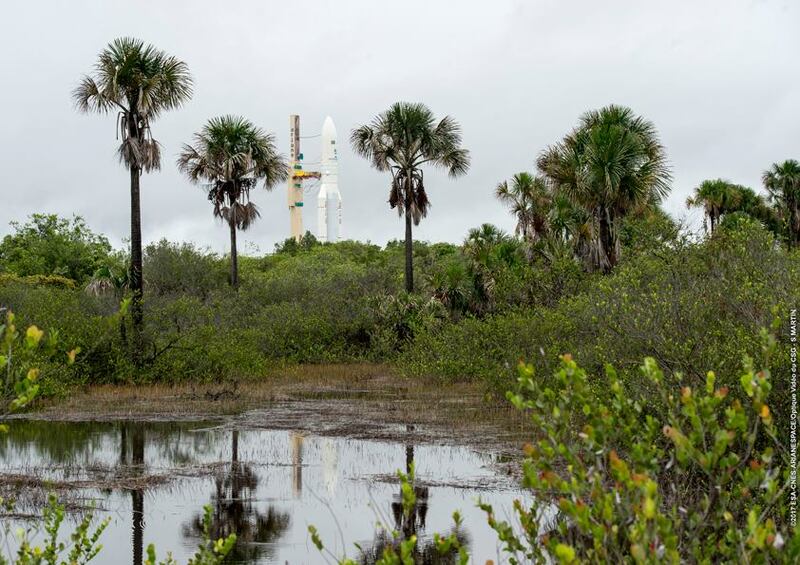 Once the launcher arrived at the pad Wednesday, ground crews connected the Ariane 5 to the facility’s propellant and electrical supplies in advance of Thursday’s countdown. The countdown is due to begin at 0908 GMT (5:08 a.m. EDT; 6:08 a.m. French Guiana time), and a check of electrical systems is scheduled around 0958 GMT (5:58 a.m. EDT). Workers will also put finishing touches on the launch pad, including the closure of doors, removal of safety barriers and configuring fluid lines for fueling. The flight program for today’s launch will be loaded into the rocket’s computer. 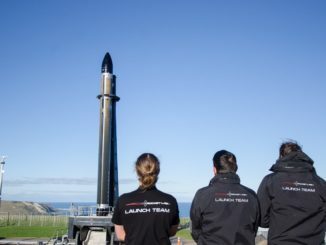 The launch team will begin the process to fuel the rocket with super-cold liquid hydrogen and liquid oxygen propellants around 1608 GMT (12:08 p.m. EDT). First, ground reservoirs will be pressurized, then the fuel lines will be chilled down to condition the plumbing for the flow of super-cold liquid hydrogen and liquid oxygen, which are stored at approximately minus 423 degrees Fahrenheit and minus 298 degrees Fahrenheit, respectively. 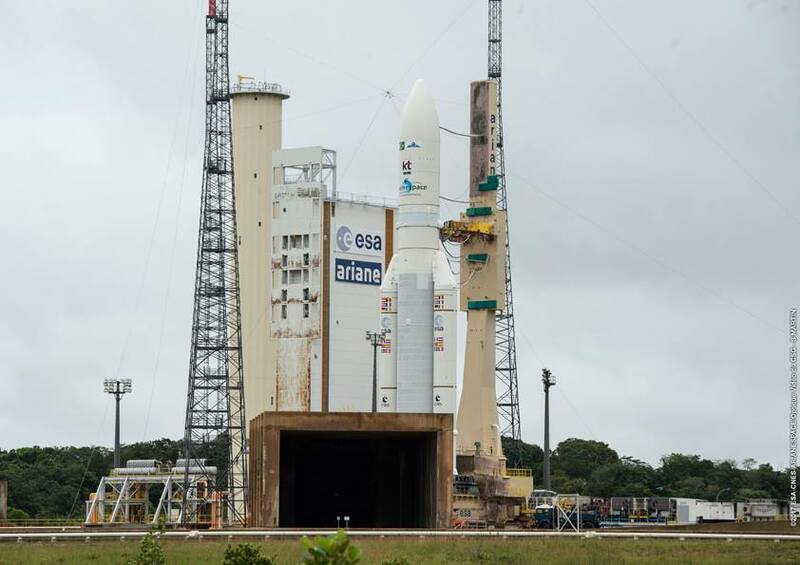 A similar procedure for the Ariane 5’s cryogenic upper stage will commence at 1648 GMT (12:48 p.m. EDT). Chilldown conditioning of the Vulcain 2 first stage engine will occur at 1713 GMT (1:13 p.m. EDT), and a communications check between the rocket and ground telemetry, tracking and command systems is scheduled for 1916 GMT (3:16 p.m. EDT). Five seconds after blastoff, the rocket will begin pitching east from the ELA-3 launch pad, surpassing the speed of sound less than a minute into the mission. The Ariane 5’s twin solid rocket boosters will jettison 2 minutes, 21 seconds after liftoff. Once above the dense atmosphere, the launcher’s payload fairing will fall away at an altitude of more than 70 miles — about 112 kilometers. The Ariane 5’s first stage will shut down 8 minutes, 53 seconds after liftoff, followed moments later by stage separation and ignition of the hydrogen-fueled cryogenic HM7B upper stage engine. The rocket’s upper stage will fire for nearly 16 minutes, accelerating to a velocity of 21,000 mph, or more than 9.3 kilometers per second, to reach an orbit with a planned high point of 35,926 kilometers (22,323 miles), a targeted low point of 250 kilometers (155 miles) and an inclination of 4 degrees. The release of SGDC is scheduled for 28 minutes, 11 seconds, after liftoff. 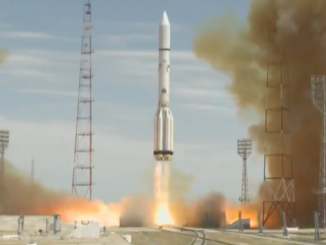 The rocket’s barrel-shaped Sylda 5 dual-payload adapter will be jettisoned a few minutes later. Koreasat 7 will separate from the lower portion of the payload stack at 36 minutes, 46 seconds. The satellites will use their on-board thrusters to circularize their orbits at an altitude of around 22,300 miles (nearly 35,800 kilometers) over the equator a few weeks after launch. At that altitude, the spacecraft will move around Earth at the same speed the planet rotates, allowing them to remain over their planned services areas for the duration of their missions. 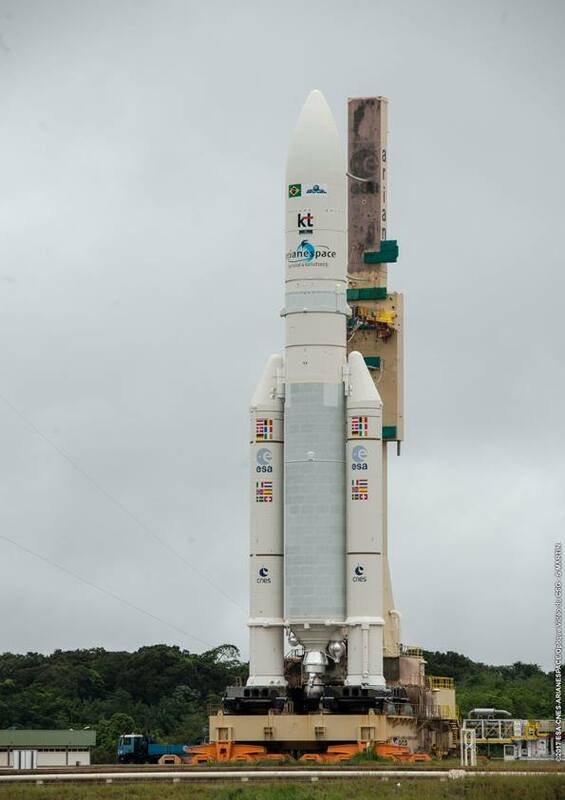 More photos of Wednesday’s Ariane 5 rollout are posted below.